We wonder if our jobs will be taken over by robots one day, and reassure ourselves that they are just machines - it is our human-ness that makes us superior to machines. 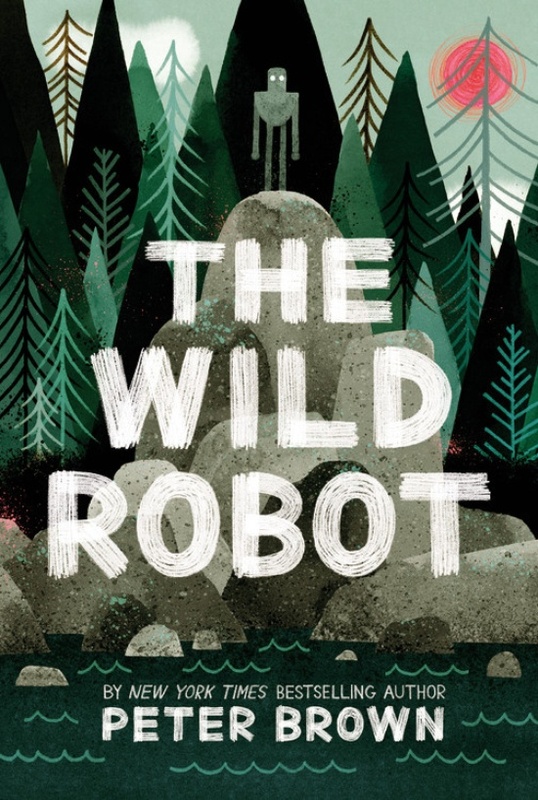 But this clever novel has another take, a robot that becomes more sensitive and responsive during its life, until we empathise with her, just as we would for a human character. The story begins on an uninhabited island. A ship has sunk and amongst the cargo that has drifted towards the island are five crates, each containing a robot. All are smashed on the rocks apart from one. Some otters discover it and while investigating one presses the button on the back of the robot's head, thus activating her - ROZZUM Unit 7134 or Roz. Her systems are very efficient. She cleans herself, maintains her systems and takes in information wherever she finds it. She has strong survival instincts which make her avoid danger and take care of herself in the hostile environment, identifying the different animals, and approaching them in a friendly way, eventually winning some of them over. She undergoes the biggest transformation when she becomes a mother to an orphaned gosling who she calls Brightbill. Her new animal friends help her build a house and grow a garden. She becomes friend to all and they in turn help her. She is a marvellous character, her logic always leading her in the direction of doing good rather than harm. I particularly loved when she decided she needed to camoflage herself and would stick flowers and suchlike all over herself with mud, and the way her behaviour became wild and uninhibited. Her manufacturers try to retrieve her and say she is 'defective', but is there something wrong with her or has she modified her own systems to ensure her survival? I don't want to give away more of this fabulous story, just to say it's one of my favourite reads of the past year. I also think it would make a great read-aloud for a classroom or at home. There are occasional illustrations in Peter Brown's distinctive graphic style, seen also in his excellent picture books. I particularly love Mr Tiger Goes Wild which I've been reading to classes at the intermediate school where I am librarian. Mr Tiger and the other residents of his town (all usually-wild animals) are dressed in Victorian garb and behave in a suitably proper manner, but Mr Tiger is sick of always wearing, doing and saying the right thing and progressively gets wilder until he has to head out to the wilderness, which he loves at first, but then finds he is lonely and goes back to town, to find that others have decided to make some changes too, making life much happier for all. His tidy geometric shapes that make up the illustrations, are made organic by the texture and colour used, and the storytelling is perfectly timed. My Teacher is a Monster is another favourite - a child meets his teacher in the park and is so intimidated by her that he thinks she is a monster, but as he gets to know her the pictures show her changing from a monster into a kind lady. You can find Peter Brown's website here where there are some great activities and merchandise linked with his books.